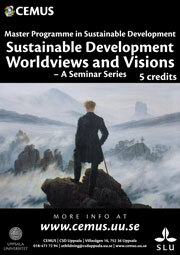 Welcome to the courses Worldviews & Visions - A Seminar Series and Worldviews & Discourses - A Seminar Series! Both courses are given by CEMUS at Uppsala Centre for Sustainable Development, CSD Uppsala. Friday March 6 at 10.15 in room Norrland II Lecture Hall, Geocentrum, Villavägen 16. Map: www.geo.uu.se/om-oss/geocentrum. 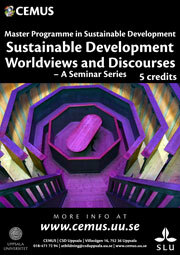 The two courses, Sustainable Development – Worldviews and Visions – A Seminar Series, 5 credits, and Sustainable Development – Worldviews and Discourses – A Seminar Series, 5 credits, critically examines the concept and idea of Sustainable Development. The Seminar Series is part of the Master Programme in Sustainable Development at Uppsala University and The Swedish University of Agricultural Sciences. The course consists of several different seminars (September-December and March-May) during which we will discuss a variety of topics together. We will also be visited by guest lecturers from different academic fields. You can read more about CEMUS educational model at www.cemus.uu.se and Uppsala University's guidelines for students and teachers "Teaching and Learning at Uppsala University". The master programme is hosted by the Department of Earth Sciences at Uppsala University in collaboration with the Swedish University of Agricultural Sciences, SLU. Warmly welcome to the spring seminar series 2015! Below you can shortly find the tentative schedule. The course is given on fridays all semester. See you soon! Books can be bought online, search several sites for best price etc. Also available at some student bookshops. The literature will concist of a number of articles as well as online resources and books. Second literature-list Click on this link! # Birkenstein Cathy., Durst Russel K., Graff Gerald"They say/I say": the moves that matter in academic writing : with readings 2. ed. Articles and required preparation, research for the seminars are stated in the schedule. The books are available through the internet (such as adlibris.se) and also at both Studentbokhandeln and Akademibokhandeln bookstores in Uppsala. There will also be some copies of each book available in the CEMUS Library – you may not take these books home- they are only for reading in CEMUS library. Assignment for Lasse Bergs book "Dawn over the Kalahari"